Galesburg FISH FOOD: What a Week! Yesterday we received a HUGE donation of yogurt from a local wholesale distributer of dairy goods. Boxes and boxes and boxes OH MY! 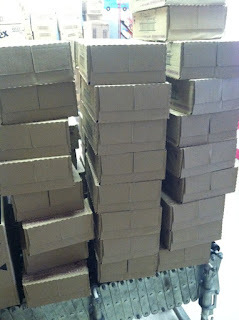 We received more than 400 cases! FISH couldn't be more thankful and appreciative for the support from local distributors. In other news.... mark your calendars! The 2nd Saturday in May is the Annual Mail Carriers Food Drive. And that's all from the Pantry this week. Happy Saturday from us here at FISH! And this was just a few of the many stacks of yogurt boxes! Feb. 9th Mobile Food Pantry!